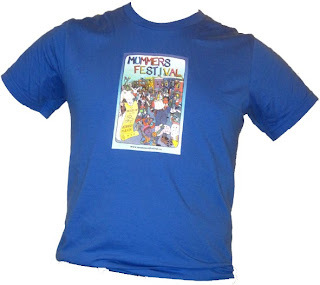 ICH Blog: Mummers Festival T-Shirts - Help support your local Mummers Parade! Mummers Festival T-Shirts - Help support your local Mummers Parade! Looking for the perfect Christmas gift for the Mummer on your list? Well, you can get one of the limited-edition Mummers Festival T-Shirts, featuring the 2010 Mummers Festival poster design by Tara Fleming. T-Shirts are available in Men's, Women's and Children's sizes. They will be for sale at the Rig Up on Saturday, December 18th, at 1pm at MacPherson Elementary School on Newtown Road. Shirts are $25 each (cash sales only, please) and all proceeds will go to support the Mummers Festival.